Snowstorms in January certainly aren’t rare. But what’s unusual about this one is how far in advance it was predicted. Unlike with most major storms, almost all the major weather models were in agreement that this storm was coming almost a week before it hit. The only differences were in how much snow it would bring. Moreover, this storm is just one of many similar storms we’ve seen in the past. We call them nor’easters because the wind is blowing from the northeast when it hits. Nor’easters are a nasty breed of storm that hits during winter. The storm began on Thursday night over the Gulf of Mexico. Cold air from the Arctic had descended upon the mid-Atlantic Ocean and combined with moist air from an unseasonably warm Gulf Stream (roughly 5 to 6 degrees Fahrenheit above average for this time of year). As the cold Arctic air sank and the warm Gulf Stream air rose, it generated a churning action — producing energy in the atmosphere. At the same time this was happening, winds from a nearby jet stream blew the storm-brewing mix toward the Gulf of Mexico where it caused severe thunderstorms in Louisiana, Mississippi, and other states Thursday night. As the nasty mix made its way up the coast, it smacked into a layer of air over D.C. — that came down from Canada — at subfreezing temperatures. This subfreezing air basically acts like a snowmaker. As the storm generates precipitation, rain falls through this freezing-cold-air layer, which transforms the rain to snow. But the worst part of it all, which makes this storm so epic, is that it’s drawing from “nearly infinite reservoir of high humidity air,” The Washington Post reported. Moving from the south is a pocket of humid air that will help fuel the storm. That means lots and lots of snow for us. It takes a lot of ingredients to make a nor’easter, and not all of them are straightforward. This winter saw an unusually strong El Niño — a natural weather pattern caused by surface heating in the Pacific Ocean, which is tied to unusual weather around the globe. This creates an abnormally strong jet stream, which provides energy for East Coast snowstorms, as Slate reported. And finally, while it’s hard to draw a direct link between weather and climate change, the warming trend may be partly to blame for the increase in severe storms like this one. As the planet warms, it’s causing a rise in sea levels, especially in the Northeast. The warmer water adds more energy and moisture to the air, which help drive severe storms like this one. While storm forecasting has come a long way, it’s still not perfect. 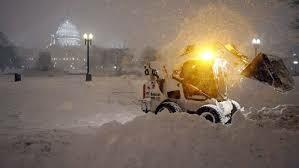 Take the “historic blizzard” that was forecast to hit New York City in January 2015, which was predicted to dump as much as 2 feet of snow on the city but only brought about 5.5 inches! ← Pakistan attack raises tough question: should teachers shoot back?